The ultimate high filtration, low noise vacuum cleaner with high performance in cleaning. 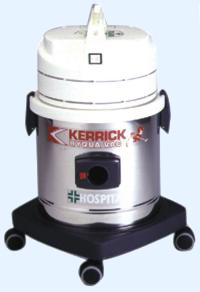 The Hospital vac's unique 3 stage filtration system traps 99.95 % of the mass producing dust and airborne germs. Filtration levels conducted by the centre of Safety Science, University of NSW. Relief for Asthma, Hayfever and Allergy sufferers, ideal for hospitals, nursing homes, laboratories and research establishments where clean air environments are important. Three stage filtration comprising filters of polyester, moltroprene and Hepa elements are standard.